The evening was dark and quiet. Mat kept silent vigil by Karen's bedside. He looked at Karen, who was still asleep. She was looking so serene, helpless and innocent. Those red stains on her lips were troubling Mat. By around 7.00 PM Mat tried to wake Karen up for dinner. The child would not wake up in spite of all that he did. In desperation, he had even tried shaking her roughly but had still made no headway. The child's body was cold. But she was breathing very steadily and this was of some comfort to Mat. He had tried calling Pradeep twice. The first time Pradeep told him he would be there soon and that he had just started for Mat's place. The second time he did not pick up the phone. Probably on the mountain road, thought Mat. He looked at his granddaughter tenderly. What had happened to his pretty Lachchu? In twenty minutes time, Pradeep reached Mat's villa. He was taken aback by the red stain on Karen's lips and immediately asked for details. Mat told him the full story of the red colored apple and what had transpired in the evening. Pradeep looked startled on hearing the story and began "you know, that is funny because...," and lapsed into silence. "Yes, yes, funny what?" prompted Mat. Suddenly Pradeep's lips tightened and he bent over Karen and began gently poking around her chest with his stethoscope. His face was grim. He pressed her tummy at various points. He took her blood pressure and temperature and then turned to Mat and said "I don't like this Mat and you are not going to like it either. Her body is cold. There is a suspicion I have. This could be something to do with black magic. I have always thought it was some old wives tale and never given it any credence. I am a man of science and I have never believed in that kind of spooky nonsense. But I have an open mind. We need to shift her to the hospital as soon as possible. We can't do it today. We will attend to it first thing tomorrow morning. I need to leave now. We will discuss this further tomorrow." "At least give her some medicines. At least tell me what is the matter with her!" wailed Mat. "Before I do any of those things I need to talk to someone. I don't want to alarm you straight away. That red stain worries me. Give me time till morning and I will get back to you. I am saying this only for your own good so that you don't attempt anything stupid," said Pradeep. With that, he turned and left through the front door without another word, his face grim and forbidding. Mat knew there was no stopping him and let him go. He went back to Karen's room and sat by her bedside. It would have been around 12.30 AM when suddenly Mat heard a tap on the window. The window overlooked the apple tree which was at some distance and Mat rushed to the window and parted the curtains. Two bright yellow eyes stared at him through the glass doors of the window. It was a cat. He had seen this cat in the village at some time or the other. It did not utter any sound. It was a strange looking cat. It had a black face with streaks of white all over. As soon as it saw him it jumped down from the window ledge and rushed away into the darkness. Though it was summer, it was cold outside. What was this strange looking cat with its frightening eyes coming around tapping on his window at midnight for? It was almost as if the cat was trying to convey some message to him. Should he go out and investigate? Mat was not frightened but he did not want to leave Karen alone for even a minute. The cat tapped on his window again at 3 AM and this time Mat's temper exploded. 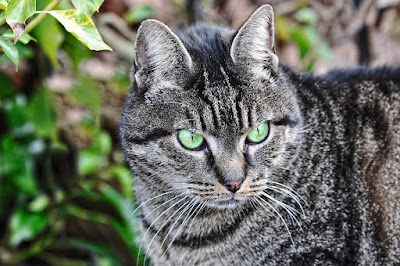 He rushed to the window and threw open the doors wishing he could wring the animal's neck, but before he could do anything, the cat had jumped down and disappeared into the darkness. Mat was very angry. First Pradeep with his cryptic nonsense about black magic and now this cat behaving as if it wanted to tell him something. He should not have waited dammit, thought Mat. The first thing he should have done was to take Karen to the hospital straight away. Instead, he had taken things lightly and called Pradeep. If anything happened to Karen because of his lackadaisical attitude he would never be able to forgive himself. He did not want to try and go to the hospital at almost four in the morning with a sleeping child in the back seat. Something told him he wouldn't be able to wake Karen up anytime soon. And the mountain road was dangerous at the dead of the night. He did not mind risking his life, but he would not take chances with his grandchild. Anyway, it was almost morning and Mat decided the best thing to do would be to ask for an ambulance first thing in the morning. Mat sighed and settled in his chair with his hand on Karen's cold forehead and closed his eyes gently. Yup! Things have just left the bad territory and stepped right into the evil. Why does it always have to be a kid! You have woven a taught story so far, Jai. Do keep 'em coming. This does not look good for Karen, and I suspect not an innocent cat at all! Looking forward to more. Whoa! This is spooky with lots of suspense in it. Reiterating it, I am loving this story. What is up with a little girl still remained a suspense. I don't think so cat has anything to do with the little girl, does he? Hmmm, I somehow suspect that cat is a witch. A father not knowing what happened to the kid. The anguish, yearning to make it right, and helplessness. Very well done. I am further intrigued as to when will the mystery be out. A hint of black magic? Makes me wonder more! Now I am in a hurry. I want to know what happened to the poor child. I am also keen to read how black magic is going to come in the picture. Heading to your next post Jai. I am late and I have this leverage to read the story in next few posts in one go. What a cliffhanger, I can’t wait to read the next part Jai. You have done your job as a writer, well done! Gets curiouser and curiouser. The cat is spooky and Mat is having his foundations questioned. Very interesting. 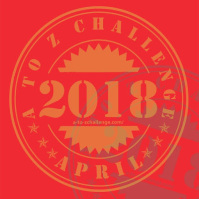 Would love it if you could check out my #AtoZchallenge post on c.